The Dakar Rally is currently tearing its way across South America, where it is generating controversy for its significant environmental and social impact, particularly in Bolivia, where nature protection is enshrined in the so-called “Mother Earth” law. EURACTIV’s partner El País – Planeta Futuro reports. The race, which this year saw 143 motorcycles, 109 cars, 46 quad-bikes and 56 racing trucks form up on the start line in Buenos Aires, is set to last more than two weeks and finish in Rosario on Saturday (16 January). In 2012, the government of Evo Morales, Bolivia’s first indigenous president, ratified the Law of the Rights of Mother Earth, in which the juridical character of Mother Earth was established as a “collective subject of public interest” and the protection and restoration of the environment prioritised. Paradoxically, the same administration was responsible for bringing the Dakar rally to the country and the semi-virgin territories of Uyuni, near the borders with Argentina and Chile. It has further been revealed that Bolivia paid $3 million for the privilege of hosting part of the annual race and that Morales was invited to co-pilot a car during the race. On the horizon, 3,600 metres above sea level, mountains can be seen. Those are the Andes, which separate Chile from Bolivia, and which peer down over the flamencos and quinoa fields that stretch alongside the salt flats. “Isn’t it wonderful?” asked Juan rhetorically. “Everyone should come here at least once in their life before it’s too late,” he said, ominously. The 2016 edition of the most famous rally in the world has included three stages that will send thousands of tyres speeding across the salt, with the landscapes normally reserved for the Andean plants and animals, transformed into a racetrack for drivers from across the globe. 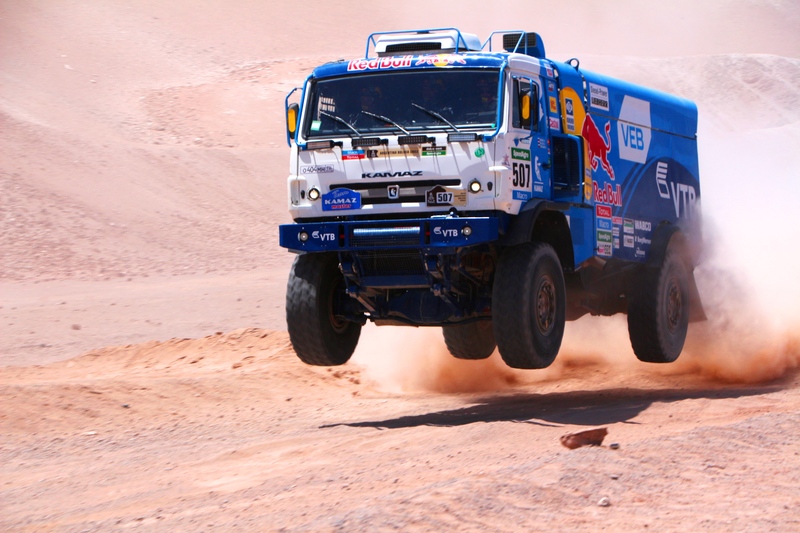 The Dakar Rally is one of the most testing and hazardous motor races in the world, with many competitors seeing the act of just finishing as an achievement in itself. Accidents, collateral damage and death are constant companions to the drivers and riders that compete in the spectacle. Competitors and spectators alike have lost their lives in accidents over the years, 64 in total, with the race gaining international attention of a more negative variety when there have been fatal crashes. This weekend alone, one spectator lost his life in Uyuni itself, when a competitor lost control of his car. The prologue to the event was marred when a car crashed into bystanders, injuring eight. Between 1979 and 2007, the name actually made sense, with the race departing from a European city, normally Paris, with the Senegalese capital of Dakar the finishing point. However, in 2008, political instability and threat of terrorism necessitated a move away from the traditional route, after the 2007 killing of French tourists in Mauritania. Al-Qaeda was thought to have been affiliated with the perpetrators. It is likely that the event also avoided a number of complications by moving away from Europe, given increased road safety and emission standards in member states. The 2009 edition was moved to South America, with a route planned through Argentina and Chile. In 2012, it took in Peru and Bolivia made its first appearance in 2014. Despite its now somewhat misleading moniker, the Dakar still attracts bumper television audiences across five continents. It remains a global event, but the controversy surrounding its impact on the environment and local communities continues to grow. So much controversy, in fact, that both Chile and Peru no longer host parts of the race and there are rumours that Argentina will be withdrawing their participation soon. In Peru, the devastation caused by El Niño has raised public sensitivity towards environmental damage. While in Chile, floods in the north of the country led the government to relocate the hosting fee for the Dakar to flood clean-up and prevention. It is easy to understand those countries’ points of view when TV pictures show hundreds of bikes, cars and trucks hurtling through natural parks, emitting light, sound and air pollution along the way. UNESCO expressed concern back in 2012 over the potential impact the race could cause to sights of natural interest and the damage that could be done. However, the race organisers have defended the development and planning of each stage. “The preliminary work starts in March, 10 months before the actual race. Studies are carried out on alternative routes and we consult we government, environmental and heritage authorities all the while. In Bolivia, this involves liaising with Ministry of Culture and the Environment,” said the Amaury Sport Organisation, a French group that also organises the Tour de France. The organisers point out the figures relating to how the race compensates for its social and environmental impact, with 100% of direct carbon emissions being offset. In 2015, 94 tonnes of plastic, aluminium, paper and glass were recycled and $635,000 was donated to help reduce deforestation in the Peruvian Amazon. Furthermore, over the past six years, sponsors, competitors and organisers have come together to make more than $1 million available for the construction of emergency housing and schools. “Every year, we study how we can improve our environmental policy,” they added. Ademar, a mechanic and guide in Uyuni, has a more pragmatic view of the event and looks forward to its arrival. “We know that the race has a negative impact on the landscape, but so do the multinational mining companies. And they are much worse,” he said. The area has the greatest concentration of lithium deposits in the world and also has valuable reserves of potassium, boron and magnesium, which has attracted several mining corporations to the area. It should also be pointed out that the Dakar has a strong social impact. Last year, accommodation was at a premium in the small town and the restaurants started charging European prices with the same meals they normally charge cents for the rest of the year. City infrastructure is certainly improved, with improved drinking water, sanitation and communications.